Many of the directions for sourdough starter result in excess that needs to be discarded. But do you really have to throw it away? I mean, after all, it's just flour and water, right? It may be bubbling a bit, or it might just be sitting there being sad and unresponsive. But it's just flour and water with not enough wild yeast to give your bread a rise. Because if it was active, you'd be using it for real sourdough bread, right? Lately I've been experimenting with sourdough cultures, trying to find the ultimate method for growing a culture with the least amount of fuss and the least amount of waste. But that experimenting has resulted in a lot of excess starter that's not quite ready to work on its own. There's no way I'm going to throw away food that I can find a use for, even if it's just flour. Unfortunately, my recipe for using that leftover starter it is less than precise. It has to be that way, though, because there's no way to predict how much starter you'll have to dispose of, or how wet that starter might be. I dumped the starter - a little over a cup - into the bowl of my stand mixer, and added enough liquid to get it to the consistency of a loose cake batter. Normally I'd add water, but in this case I added some apple cider to give the bread a bit of sweetness, and just a little bit of milk to soften the crumb. If you're making it, all water is just fine. I've said before that you should scald milk before adding it to bread, but I didn't use much - maybe two tablespoons, so I wasn't concerned. I added enough bread flour to turn it into a dough. I've made enough doughs to know what my usual amount of dough looks like, and I typically bake single loaves of bread that have roughly 12 ounces of dry ingredients and 8 ounces of liquid. For that amount of flour and liquid, I typically use 2 1/2 teaspoons of yeast and a teaspoon of salt. This lump of dough looked pretty typical, so I added two teaspoons of instant yeast and 1 teaspoon of kosher salt. I kneaded it with the dough hook until it was silky, stretchy, and smooth, then I added some olive oil - maybe a tablespoon or so. I kneaded until that was incorporated, then formed the dough into a ball, coated with a bit more olive oil, and set it aside to rise in the stand mixer bowl, covered with plastic wrap. It took about 2 hours, but that's will vary depending on your particular dough. A proper rise is more important than how much time has elapsed. I kneaded the dough again, formed it into a ball, and put it on a cornmeal-sprinkled baking sheet. The oven was already heated to 350 degrees from a previous loaf of bread, so I left it there. I let the dough rise until doubled - about 45 minutes (typically the second rise is half the time of the first rise) then slashed it and baked it at 350 degrees for about 40 minutes. There's no way I would call this bread "sourdough," since it used commercial yeast for rising. But because the proto-starter had developed flavor, the resulting bread was more complex than a typical loaf of white bread. The experiment was a success. When we drove to Chicago for a family get-together, I stopped at stores all along the way looking for interesting regional products. Since we stopped in both Kansas City and St. Louis, barbecue sauces and rubs landed in my cart with alarming regularity. Babyback pork ribs were on the menu, the grill was standing ready, and I randomly chose one rub and two sauces to sample. The rub was Zarda Barbecue Rub, and the two random sauces were Gates Sweet and Mild and Maull's Sweet and Mild. I didn't purposely pick two "sweet and mild" sauces, but they were the first ones I grabbed from their respective cities. I sprinkled the ribs generously with the rub about an hour before I was ready to cook, and put the ribs into a plastic bag and tucked it into a fridge. When it was time to cook, I seared the ribs on both sides, then moved them to a cooler part of the grill and turned the heat down, and left them cooking for about 90 minutes. When I pulled them off, they were soft, juicy, and very pretty. I decided not to sauce them on the grill so we could sample them with just the rub and then sample the sauces separately. The taste test? The rub added nice flavor, but confirmed that I'm a saucy-rib kind of gal. The Maull's had a definite tomato flavor, and the label didn't lie. It was sweet and it was mild. It was like a thin ketchup with a little more flavor. The Gates sauce had a little more smoke and spice, but it also was sweet and mild. Neither were bad, but neither were amazing. The goal of my sauce-buying binge was to find the sauce of my dreams and then recreate it. I've made sauces before, but it always seems like something is missing when I actually use them. The problem is that the sauces always taste different when they're being made than the do when they're being used. So I figured that if I could find the bottled sauce that hits the right notes when it hits the meat, I can use that as my example when I build my own sauce. Meanwhile, the ribs were really good. Sauced, not sauced, it didn't matter. They were just what I needed to remind me that although summer's officially over, there's still some good barbecue weather ahead. After working on perfecting apple cider bread, I kept thinking about what else I could do with apples in bread. I've already done an apple cinnamon bread, so I was looking for something different. Halloween decorations and the chill of fall in the air got me thinking about caramel apples. Neither of the apple cider breads that I had made were particularly sweet, which was the goal. But once I got the idea of caramel apples in my head, I wanted to marry that sweet flavor with the tart apples. My favorite caramel apples are the ones with nuts on the outside. So that was the flavor profile I was looking for. Like the apple cider bread, I used grated apples and apple cider in the dough, but I wanted that mixture of apples, sweet caramel, and nuts to shine through, just like that first bite of a caramel apple leads to pure apple. To accomplish that, I made a swirled bread with dulce de leche, diced apples, and chopped peanuts in the sweet swirl. In the bowl of your stand mixer, combine the apple cider and instant yeast. Set aside until foamy, about 10 minutes. Add about 9 ounces (2 cups) of the flour and stir to combine. You can eyeball about 2/3 of the total amount if you've pre-measured it all. Cover the bowl with plastic wrap and set aside for 1 hour. Add the remaining bread flour (4 1/2 ounces or 1 cup), sugar, and salt. Knead until the dough starts to become elastic. Peel one apple, and working quickly so the apple doesn't go brown, grate it directly into the bowl, stopping at the core. Continue kneading the dough until the apple is incorporated. Since different apples will have different amounts of liquid, you may need to add more flour to adjust the moisture in the dough so that it's no longer sticky. I needed to add an additional 1 1/8 ounces (1/4 cup). Add the olive oil and continue kneading until the oil is completely incorporated. Form the dough into a ball, lightly drizzle with olive oil, and return it to the bowl. Cover the bowl with plastic wrap and set aside until doubled, about an hour. Preheat the oven to 325 degrees. Get a 9x5 loaf pan ready, If you want a bit of extra insurance that you loaf will leave the pan easily, spray it with baking spray or use a sheet of parchment folded to fit the bottom and up the long sides. Put the dulce de leche into a small nonstick pan and heat slowly on medium-low heat. Add the peanuts to the pan. As the caramel begins to melt, peel the apple, core it, cut into a 1/4-inch dice, and mix it into the caramel quickly so that it doesn't have a chance to brown. Cook on low for another minute, then turn off the heat and set aside until you're ready to use it. If it's too stiff to spread when you are ready for it, you can rewarm it gently, but you don't want it to be hot when it meets the bread. Flour your work surface and turn the dough out. Knead it briefly, then form it into a rough square, then roll it out to a rectangle approximately 9x16 inches. Spread the caramel mixture onto the dough leaving about 1/2 uncovered on the long sides, and about 2 inches uncovered on one of the short sides. Roll up the dough, jellyroll style, tucking in the sides as you go and ending at the short end that was left uncovered. Seal the seam and the ends, and place in the prepared loaf pan. Cover the loaf with plastic wrap and set aside to rise until doubled, about 40 minutes. Uncover the loaf, slash as desired and bake at 325 degrees until golden brown, about 45 minutes. For a soft brown crust, take the loaf out of the oven and spread the butter over the top of the loaf about 5 minutes before it is done. Return the loaf to the oven and bake the final five minutes. Cool the loaf for five minutes in the pan, then turn it out and let it cool completely before slicing. Okay, I'll admit it. Some of my recent mushroom posts have been inspired my a mushroom contest running at TasteSpotting. It would be nice to win a little something for my efforts, but I'm not selling my soul for the contest, either. I really do like mushrooms. A lot. Okay, I'll admit it. I looooove mushrooms. This time, I decided to pair the mushrooms with a giant zucchini that suddenly appeared in my kitchen. This wasn't a ridiculously overgrown zucchini, but it was a lot bigger than the little ones that I like raw in salads. The seeds weren't completely inedible, but the center was getting spongy. I used about a third of the length of the zucchini. I cut that third lengthwise in thirds, turned it 90 degrees and cut in thirds again. I removed the center piece which was the spongiest portion, then cubed the rest. Heat the olive oil in a medium frying pan, then add the zucchini. Let the brown a bit, then add the mushrooms. Season with salt and pepper. Cook until the mushrooms release their water, then add the piquillo peppers and a splash of balsamic vinegar. Keep cooking until the liquid has evaporated. When I heard that Serious Eats guru Adam Kuban was coming to Denver to sample hot dogs, I volunteered my services as sidekick. Happily, he agreed to let me tag along. Here's Adam, looking happy. We're gonna go eat hot dogs! Yay! I'm not sure who those four guys in the background are. They might be (a) a barbershop quartet; (b) a nonthreatening-looking gang; (c) employees of the business in the background wearing the company tee shirt; or (d) guys eating hot dogs. My money's on c and d.
Adam had one place on his "must try" list, and that was Biker Jim's, a stand that can be found at the 16th Street Mall in Denver during the week, and in the parking lot of Argonaut Liquors on Saturdays. Since it was Saturday, we headed off to the liquor store. Biker Jim's had a bit of a crowd assembled, so we had some time to chat, take photos, and decide what dogs to sample. For some reason, we talked a lot about food. And a little about Serious Eats, which is all about food, anyway. It's funny how, when you have out of town guests, you rediscover your own town. In this case, we toured and tasted beers in Longmont, Colorado. First stop: Left Hand Brewing Company. I read about the Miracle Berry several years ago, and it intrigued me. When you eat this strange little fruit, it does something odd to your taste buds so that sour things taste sweet. Lemons and limes are supposed to be sweet and Guiness beer is supposed to taste like a chocolate malt. I looked online to find this strange berry, but didn't have a lot ot luck finding a good source. But then I found a nursery that was selling plants. So I bought one. It's a nice looking plant and I got one that was a decent size, maybe about two feet tall. The first year, at first the plant didn't do much at all, but when I moved it outdoors and fed it some acidic fertilizer it started growing new leaves and looking a lot happier. Later, I got a couple reluctant flowers, but no fruit. The second year, I got two crops of flowers and two berries that never got ripe. This year I got a lot of flowers before I moved the plant outdoors (I move quite a few plants outdoors during the summer and move them back indoors when it gets cool.) The first batch of flowers didn't give me any berries, but then it bloomed again. A lot fewer flowers, but I got one berry and it was early enough that now it's ripe. It's a pretty thing - bright red against the green leaves. But does it really do what I've heard? Does it really change the way things taste? Do you love the marinated mushrooms that are sold at olive bars and in jars? Why not make your own? You can tweak the flavors and the tartness to suit your taste and match your meal. Make a few or make a big batch. Toss them into salads, eat them as appetizers or snacks, use them in recipes...the possibilities are endless. While I love the garlicky marinated mushrooms sold at my local specialty store, there are times I don't want that much garlic. And although I'm a big fan of tartness, it's not a bad idea to temper that a bit. There are plenty of smooth vinegars to choose from. I didn't eliminate the garlic entirely, though. Instead of using regular garlic, I used black garlic, which has a sweeter, smoother and less harsh flavor. For the vinegar, I chose a good sherry vinegar. If you don't have sherry vinegar, balsamic or red wine vinegar would be good - or use half red wine vinegar and half balsamic for a nice balance. Put the mushrooms into a zip-top bag. Combine all the other ingredients, taste for seasoning, and adjust the tartness and sweetness by adding more vinegar, olive oil, or sugar, as desired..
Pour this mixture over the mushrooms in the bag, seal the bag, and gently massage the mushrooms to get them evenly coated with the marinade. You can serve these immediately, after an hour or so, or any time you like. I like them best after a day, when they've fully absorbed the marinade, and they're good for days afterward. And don't toss the liquid - you can find plenty of uses for it as a dressing for salad, or in your cooking. One of the keys to getting a loaf of bread that rises well is developing the gluten enough so that it will hold all the lovely gas bubbles that the yeast creates, and then stretch even further so those gas-holding pockets can expand in the heat of the oven. 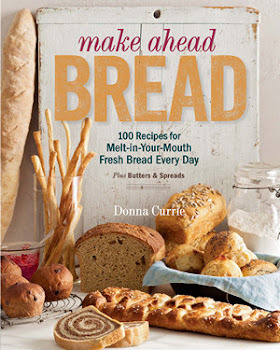 Most bread recipes, mine included, will tell you to keep kneading until the dough is smooth and elastic. That's simple enough, right? The dough goes from being a clumpy, lumpy mass to something that is cohesive and, well, smooth. And instead of tearing off in ragged chunks, it begins to stretch. And the more you knead, the stretchier it gets. But when do you stop kneading? How elastic does it need to be? Oh, if only there was a simple test for checking the elasticity of the dough! But wait! There is! It's the Windowpane Test! Ask about the windowpane test in any serious bread-baking forum and it's almost guaranteed that some wise guy will tell you to throw a hunk of dough at the window, and if it sticks, it's done. In kinder, gentler groups, someone else will probably explain the windowpane test. But pictures are so much better than words, aren't they? To begin the windowpane test, pull off a small bit of dough, about the size of a marble. Flatten it out, then begin gently stretching it. Keep stretching. Imagine you're making a pizza for Barbie, and she likes the super-thin crust. If you can keep stretching an pulling the dough until it's a thin membrane that you can see through, the dough is elastic enough. Here's a closeup of fingers seen through the dough. You can sort of see the webby network of gluten. You can keep stretching and eventually it will tear because it's simply too thin or you've poked a finger through. But it should be able to stretch very, very thin before it breaks. Doughs that include seeds or are made with gritty flours will tear sooner, simply because the bits tear through the membrane. This is the same thing that happens in the bread as it bakes, and it's one reason why breads made from whole grain flours tend not to rise as well as those made from more refined flours. But even with those doughs, you should be able to stretch it well enough to see that thin membrane. And if your dough passes the windowpane test, the gluten is developed well enough for it to hold the bubbles while it rises, and stretch even more as the gasses expand from the heat. Simple, hmmmm? For no good reason, the words "milk and honey" were bouncing around in my head when I was thinking about a new bread. I didn't want a sweet bread, though. I wanted something that would be savory and interesting, but also useful for sandwiches. In particular, I wanted something that would complement a tomato and mayo sandwich. I nixed the idea of making anything with oregano or basil after a brief consideration, even though both would pair nicely with tomato. I settled on saffron. It has warm, luxurious flavor, and it adds beautiful color. A little saffron goes a long way - the flavor should tease your senses rather than sledgehammer them into oblivion. The resulting bread is soft, but not in that annoying gummy squishy way. As for the flavor, even though I knew what was in it, my first thought was how buttery is was. 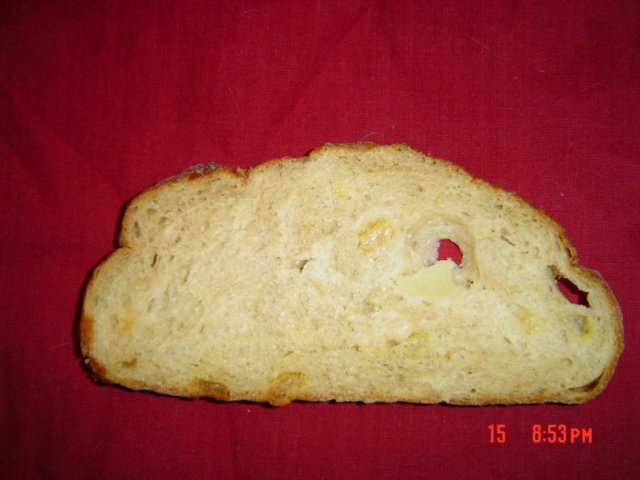 The bread is a pale yellow; not enough that it seems artificial, but just enough to hint at specialness. This is great buttered, toasted, as part of a sandwich, or just plain. It's that good. Pour the hot milk into the bowl of your stand mixer, add the honey and saffron and stir to melt the honey into the milk. Let cool to room temperature. Add the yeast, stir to combine, and let sit until it is frothy, about 10 minutes. Add the bread flour and knead with the dough hook until the dough is smooth and elastic, about 10 minutes. Add the salt and olive oil and continue kneading until the oil is incorporated and the dough is smooth, shiny, and elastic, another minute or two. Form the dough into a ball and drizzle some olive oil over it to coat it. Return it to the bowl, cover the bowl with plastic wrap, and set aside until doubled in size, about an hour. When the dough has doubled in size, take the dough out of the bowl and, without deflating it completely, form it into a tight, round ball. Place the ball seam-side down on the prepared sheet, cover it with plastic wrap, and set aside until doubled, about 30 minutes. When the dough has doubled, slash it as desired and bake at 350 degrees until golden brown, about 40 minutes. Along with the lamb chops from the previous post, I grilled some portobello mushrooms. To prepare the mushrooms, I brushed them on the top with olive oil, brushed the gills with lemon olive oil, and sprinkled with a bit of salt. They willingly shared the grill with the lamb chops. By the way, those aren't huge portobellos in the photo, those are really small lamb chops. I grilled the portobello mushrooms until they were just about cooked through. The great thing is that you can eat them anywhere from raw to fully cooked, so it's entirely up to you. The portobello is meaty enough to work as a vegetarian entree or as a side dish for meat eaters, and grilling adds a nice smoky flavor. To finish the meal, we had fresh cucumbers and tomatoes served on my new salt slab. Okay, not really Facebook, but some of my Facebook friends started talking about some kind of bread that they thought sounded good, and the next thing you know I was dragged into the conversation with the suggestion that I should make this bread and publish the recipe. Well, fine, I'm up for a challenge. And this was really a challenge because I was trying to replicate a bread that I had never tasted. And some of the people who were asking about the bread had never tasted it either. The bread in question is sold by Wegmans and the major ingredients are: Enriched Flour, Apple Cider, Apples, and Golden Raisins. Minor ingredients (2% or less) are: Apple Juice Concentrate, Yeast, Rye Flour, Salt, Cinnamon, High Fructose Corn Syrup, Silicon Dioxide, Citric Acid, Natural and Artificial Flavor, and Preservatives. In my world, raisins are always optional, so my ingredient list for my first effort includes bread flour, apple cider, apples, boiled cider, yeast, vanilla, salt and cinnamon. I think the easiest way to deal with apples for a recipe like this is to cut them in half, core with a melon baller, then cut the halves in half and peel those quarters. But do it any way you like. This was Version 1 of the recipe. (There was a second version that was less than wonderful and a third version in another post. Not that I disliked this version, but it has a lot of potential for different tastes. In subsequent versions, the apple pieces were smaller, with even more apple flavor to the dough. This also spawned a Caramel Apple Bread that was sweeter than either of the two apple breads. As far as the cinnamon, it's very subtle. I think I might add just a touch more in a different version. Needless to say, I have no idea how close this is to the target. All I know is that it's almost gone already, so it must be good. In the bowl of your stand mixer, combine the apple cider and yeast. Meanwhile melt the butter in a skillet. Peel, core and quarter the apples, then cut it quarter into eight chunks. Toss the apples into the skillet and cook them for a few minutes. You don't want them fully cooked, but cooking the outside stops the oxidation that turns apples that unappealing brown. By this time, the yeast should have dissolves and it should have begun foaming a bit. Add 2 cups of the bread flour and mix. It will be rough and shaggy. That's fine. Cover the bowl with plastic wrap and set aside for one hour. When the apples are lightly cooked on all sides, remove them from the pan and set aside to cool trying to keep as much of the liquid behind in the pan. Save that liquid; it will be going into the dough. In an hour, the dough will have risen quite a bit. Add the remaining bread flour, salt, boiled cider, vanilla, cinnamon, all the liquid from the pan where the apples were cooked, and any additional juices that have seeped from the apples as they rested. Knead with the dough hook until the dough is smooth and silky. Flour your work surface and turn out the dough. Put the apples on top of the dough and fold and knead the dough until the apples are incorporated into the dough. It's fine if some are sticking out the sides, but try to get them evenly distributed. Put the dough back into the bowl to rise again. Cover the bowl with plastic wrap and set aside to rise until doubled, about 30 minutes. Meanwhile, preheat the oven to 350 degrees and line a baking sheet with parchment paper. When the dough has doubled, take it out of the bowl and form it into a nice tight ball. Try to make sure all the apples are encased in the dough. Place the dough, seam-side down, on the baking sheet. Cover the dough with plastic wrap and set aside until doubled, about 20 minutes. Bake at 350 degree for about 40 minutes, until it is golden brown. As hard as this is to believe, I was on my way to making bread and ended up making cheese. I wanted to bake a loaf of bread and at the same time I realized I was overstocked with milk. So I decided I should make a bread that would use a lot of milk. I put 1 1/2 cups of milk in a saucepan to scald it. Heat went on, milk barely started to bubble, and then it looked ... funny. I stirred it and there were great large lumps of curd in the whey. Now, I know the milk wasn't bad. Not even starting to go off. This was the milk I had used in my coffee in the morning. It was fine. Except for some reason it wanted to separate when it was heated. Okay, cheese then. I've made enough cheese. I can wing this. But 1 1/2 cups of milk is not nearly enough to make a sensible amount of cheese. So I tossed in the rest of the milk from that batch of milk, which was a bit over a quart. I stirred it around, kicked the heat back on and nothing was happening. Decided to add a bit of acid to move it along, and found 1/2 of a lemon that had been partially squeezed. Got the juice out of that and dumped the lemon juice into the water. Still no separation. In fact, the curds that had been there before had now dissolved. I had hot lemony milk. Sigh. And the bread was waiting to be made. I figured that the lemon must not have been acidic enough, so I grabbed the True Lime off the shelf, shook a little (maybe a quarter-teaspoon) into a small glass and added about a quarter-cup of cool water to dissolve the powder. I dropped that into the milk and gave it a stir and got an immediate reaction. I let it cool a while, then strained out the curds, added a sprinkle of salt, stirred that around, and put it in the refrigerator to chill. I considered squeezing it to get a shaped, compressed cheese, but I had a good use for it as it was. The resulting cheese had small curds and a soft, creamy consistency with just a tiny hint of lime flavor. It was perfect served over the chicken mole tacos we had for dinner. This isn't very precise recipe, but I don't expect anyone to follow it step-by-step. Because, after all, how often does it happen that you heat milk and it suddenly separates? And, if I hadn't used the milk just an hour before, I might have assumed the milk had gone bad and tossed it out. But no, it tasted fine in the coffee and was just as good in the cheese. But it's a good example of salvaging something that would otherwise have gone to waste. And I managed to use up even more milk, which was even better. And I'm saving the whey for breadmaking, of course. It's approximately 8 x 12 x 1 1/2 inches, and weighs about 16 pounds. For baking, cooking and serving. I'm sure there will be recipes to come. Yes, I said "mushrooms" twice. I looooove mushrooms. They were my favorite food when I was a kid, and I never outgrew my fondness for them. The first mushrooms I ever ate came from a can, and later I discovered the wonders of fresh mushrooms. Button mushrooms were the first fresh mushrooms I learned how to cook, and I still love them. There are more exotic mushrooms in the stores these days, but button mushrooms are always available and they're comfortingly familiar. They're great raw, cooked, or pickled. What's not to love? But sometimes one mushroom isn't enough, so I added a portobello for some variety in both texture and flavor. I love lemon and mushrooms together. Here, it's not so much a flavor as an added brightness. If you want a lemony flavor, add a squeeze of lemon after plating. Cook the pasta in salted water, timing it so that it is just short of al dente when the mushroom mixture is finished. Add the verjus (or wine) to deglaze the pan, and cook a few moments until the liquid is bubbling. Add the cooked pasta and stir to combine, adding pasta cooking water as needed to moisten the pasta to allow it to finish cooking and absorb mushroom flavor. Add the tomatoes and basil and toss to combine. Taste and adjust seasoning. Transfer to a serving plate and drizzle with additional olive oil if desired. This is nice served with cheese on top.